Community assembly involves a large number of processes and constraints. One area of active research is the development of "community assembly rules," or generalized patterns arising from the operation of ecological mechanisms acting simultaneously in the environment. Belyea and Lancaster (1999) present a model of the hierarchical application of assembly rules (and, in their terminology, constraints) to understand how the assemblage of species present at a given site (the "actual species pool") is selected from all species present in a region (the "total species pool") (Fig. 8.1). FIGURE 8.1 Hierarchical application of assembly rules and constraints resulting in the assemblage of species present in a habitat (with permission from Belyea and Lancaster, 1999). 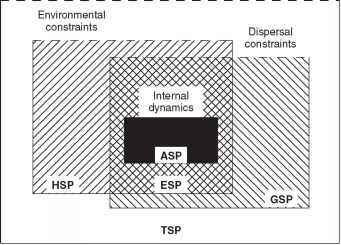 TSP, total species pool; GSP, geographical species pool; HSP, habitat species pool; ESP, ecological species pool; ASP, actual species pool of a community. See text for description of species pools. Only a subset of species from the total species pool will be able to disperse to the site in question; this is the "geographical species pool." Composition of the total and geographical species pools is determined by evolutionary history and the particular location relative to distributions of the species; in other words, geographic and historical contingencies. The "habitat species pool" is a subset of the total species pool that could survive at the site based on its environmental characteristics and the species' physiological limits. The overlap between the habitat and the geographical species pools is a set of species called the "ecological species pool." Given enough time, we might expect most species in the ecological species pool to be able to complete their life cycles at a site if they are adapted to the dynamic equilibrium system in place. However, at any given time, the ecological species pool is constrained to the actual species pool by "internal dynamics," which are species interactions such as competition and exploitation. The hierarchical application of community assembly rules is nicely illustrated by the theory of island biogeography. MacArthur and Wilson's (1967) original theory tried to explain island species richness. Species richness is assumed to be governed by equilibrium between colonization rate of new species and extinction rate of resident species. The habitat species pool can be thought of as the number of appropriate species present on a nearby mainland. The theory is based on the following four assumptions: (1) The immigration rate of nonresident species declines with increasing species richness of the island (the overall immigration rate of species is constant, but the proportion of immigrants that are not already represented on the island changes with species richness of the island). (2) The extinction rate of species on an island increases with increasing species richness (due to increased competition). (3) At a given species richness, the extinction rate of species is lower on larger islands; in other words, a larger island can support greater species richness (due to greater habitat diversity on larger islands and larger populations less prone to stochastic extinction). This is a commonly observed empirical relationship called the "species-area relationship." (4) Immigration rate of new species to an island declines as the island is more distant from the mainland. The first three assumptions are community assembly rules constraining the actual species pool, while the fourth is a rule constraining the geographical species pool. Equilibrium species richness for any island could be predicted by finding the point of intersection between the colonization and the extinction curves given for that island's distance from the mainland and its size (Fig. 8.2). These rules, and predictions from the theory, have been found valid for many taxa on islands (including some "islands" of terrestrial habitat patches distributed in a substantially different habitat matrix), but not in all cases. Some islands may have not yet achieved equilibrium because of lack of enough time for colonization. Lomolino (1999) presents an alternative theory based on individual species area requirements and dispersal abilities to solve some of these anomalies and predict community composition as well as species richness. 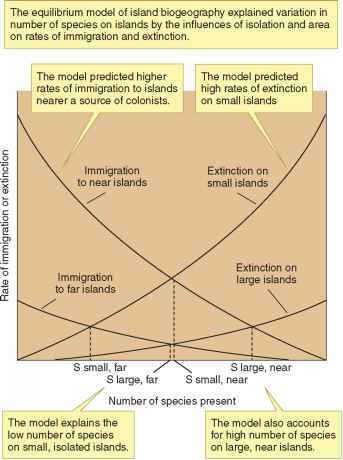 FIGURE 8.2 Island distance and area and rates of immigration and extinction based on the equilibrium model of island biogeography developed by MacArthur and Wilson. Reproduced from Molles (2002) with permission of The McGraw-Hill Companies. disturbances are also important. Wardle et al. (1997) examined 50 islands of varying area in the northern Swedish boreal forest zone. On these islands, area significantly impacted the frequency of fire as larger islands were more often hit by lightning strikes than smaller islands. The result was a difference in plant species composition as a consequence of fire return rate. Smaller islands were more diverse floris-tically and had more late successional species with poor litter quality compared to larger islands. The differences in fire return rates and aboveground species composition among islands translated into differences in belowground community dynamics on islands of different sizes. Smaller islands had greater humus accumulation, lower microbial activity, and reduced decomposition and N mineralization rates compared to larger islands. The results suggest that while specific relationships (area, distance from source) govern the number of species in an area, attributes of specific plant species have a great impact on the overall ecosystem function. These results should be considered by conservation ecologists and other resource managers as park systems and reserves operate as islands in a sea of other land use types, and the impact of aboveground management schemes on belowground communities must be considered for maximizing success of the desired outcome. Ecosystems are systems defined by organisms and the environment within which these organisms interact. They are spatially defined by the interactions of the organisms and their relationship to physical space as an integrated system. The scope of a single ecosystem may extend into the atmosphere or deep into the earth's crust. Ecosystem dynamics are dependent on defined temporal scales. Ecosystems are impacted by long-term and short-term events. Trees are still migrating following the last glacial retreat, altering the components of ecosystems. Humans, which have been on the planet for a very short time, have altered ecosystem dynamics through cultivation and burning and, more recently, globally by increasing soil chemical loads and introducing pesticides and other man-made chemicals. They have also altered the global C cycle by releasing stored C from storage pools. The consequence is an altered planetary climate that will impact most species though altered temperature and moisture regimes. The specific components of an ecosystem and the controls over those characteristics are largely determined by the "state factors" described originally by Dokuchaev (Jenny, 1961). The state factors include climate, time, parent material, potential biota, and topography. These factors set bounds on the types and rates of processing and the raw materials available for processing within the ecosystem. Climate determines rates of processing by controlling moisture availability and temperature. Time is an important factor for evaluating the degree of weathering of soils or vegetative development since a disturbance. Parent material determines the types of micro- and macroorganisms that can exist and the nutrient and water holding capacity of the medium in which plants must grow. Potential biota includes all organisms that can exist or have existed in an area. For example, deep rooting grasses will differ from other types of plants in their impact on soil development by contributing materials at depth that will be converted into organic matter and turnover slowly. Rooting depth, C:N ratio of materials added to soils, density and diversity of plants, animals, microbes, etc., will all contribute differentially to the soil produced. Finally, topography determines access to water, movement of materials, soil depth, and degree of weathering and can alter plant community structure based on placement along a topographic gradient. Anthropogenic influences have been added to this list of state factors as human impacts on soils can alter the historical development of soils, resulting in soils with novel characteristics. Discussions of ecosystems within an ecological context focus on energy flows, elemental cycles, and emergent properties. Soil organisms and processes are integral to the development and functioning of all terrestrial ecosystems and, as such, an understanding of soil biology and biochemistry is essential for characterizing ecosystem dynamics. Soil dynamics drive elemental cycles, have controlling roles in ecosystem functions, and are largely determinants of emergent properties (properties not obvious from study of processes at finer levels of organization) such as decomposition rates, nutrient flows, and productivity.